A major problem with the naturalistic evolution of the universe is the Second Law of Thermodynamics. Note the emphasis on the word 'law' (discussed on the Science, Uniformity, and Causality page). A natural law is as close to a scientific fact that we can get, so if a model violates a law then the model should be thrown out. Whatever brought the universe into existence is no longer in operation, because no new energy is currently being created (First Law of Thermodynamics). The Second Law of Thermodynamics states that in a closed system energy is changing into a form that is less usable than its original state (chemical energy to heat and light energy). That would mean if you went far enough back all the energy in the universe would have been in its highest, most usable state. This point would be the beginning of the universe. The Second Law cannot be overcome by adding energy on this scale because the universe is a closed system. The universe is not dense enough to pull itself back together again. There is no known law of physics to cause such a pull to make them come back together. It could not happen an infinite number of times because you cannot have an infinite number of finite events. If the universe did expand and contract then you could view it like a bouncing ball where each time it bounces the ball only goes about half the distance until there is a time where it is no longer bouncing. Because of all these problems we have to view the universe as a closed system and that means there had to be a beginning. When the big bang theory originated they originally guessed that the size of the mass that exploded was several light years in diameter. Now they are saying that the big bang originated from "A point of dimensionless space." What is a point of dimensionless space? They are very careful to not say that 'nothing' exploded and caused everything because they know that nothing can do nothing, and nothing can come from nothing. How did this "point" in space contain all the energy in its most useful form? The universe had to have a beginning, so what was here before the big bang? Where did all the 92 naturally occurring elements come from since the big bang was only supposed to produce hydrogen? If there was an explosion that forced all the mass away it should be evenly distributed; however, it is not. There are large chunks of mass called galaxies, and then gigantic voids. How did these gases get together and form the galaxies since Boyle's Gas Law shows that gases cannot come together from their own gravity? The Horse Head Nebula and Orion Nebula have often been called star nurseries because it is believed that the dust floating around in the nebula will collapse with some form of circumstellar disc and get pulled to the center to form a star. This process is supposed to take around 100,000 years to get the initial star formed and then over the next 10 million years to 25 million years the dust cloud either gets pulled in or dissipates and a normal star is what remains. How many stars do we see form every year? The answer is zero. It has been estimated there are over 70 sextillion stars in the universe, but we have never seen a star form. We have seen spots getting brighter, but we have never seen a star form. Nebular Theory (that is not actually a theory) is the best suggestion on how a star could have formed. It is said that our star, the sun, was formed by a large gas cloud that was hit by a blast from a neighboring supernova and caused it to compress to start swirling. This supposedly would cause the cloud to start to collapse under its own gravity and form a star. Where did the original supernova star come from? How did it compress the gas since it was in a frictionless environment? Why wouldn't gravity do it all by itself? Gravity is one of the weakest forces in nature. You can easily supersede gravity every time you stand up or pick something up. A cloud of gas has so little mass and occupies such a large area that it has almost no gravity and therefore it is impossible to collapse under it's own power. When gravity does start to make it collapse heat is formed from the friction. While this may seem logical since it is going to explode to form a star, the problem is that heat causes gas to expand. 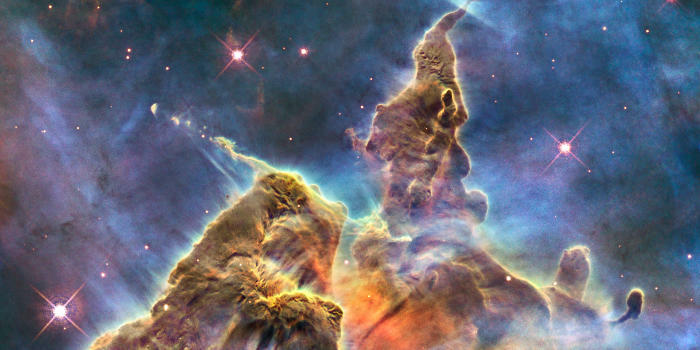 It has been observed in gas nebula that the large clouds that were thought to be condensing to form stars were actually expanding because of their own heat. Stars cannot form under any known natural process.